House and Senate Documents – Contain various other materials ordered printed by both chambers of Congress. Documents can include reports of executive departments and agencies, some of which are submitted in accordance with Federal law, then later are ordered printed as documents. Sometimes committee prints are ordered printed as documents also, if the information they contain is in demand. Documents have a larger distribution than committee prints. Senate Executive Documents – Contain the text of a Treaty as it is submitted to the U.S. Senate for ratification by the President of the United States. Beginning with the 97th Congress in 1981, Executive Documents became known as Treaty Documents, and they are now numbered instead of lettered alphabetically. Senate Treaty Documents – Contain the text of a Treaty as it is submitted to the U.S. Senate for ratification by the President of the United States. Numbered consecutively from the 1st Session through the 2d Session of a Congress. Prior to the 97th Congress known as Executive (Lettered) Documents, and identified by letters of the alphabet. House and Senate Reports – Reports of congressional committees concerning proposed legislation and/or contain findings on matters under investigation. Senate Executive Reports – Reports of the Committee on Foreign Relations relating to Treaties between the United States and foreign nations, which have been submitted to the U.S. Senate for ratification, or are reports of various Senate Committees regarding nomination of individuals. Conference Reports – From the earliest days, differences on legislation between the House and Senate have been committed to conference committees to work out a settlement. The most usual case is that in which a bill passes one Chamber with amendments unacceptable to the other. In such a case, the Chamber that disagrees to the amendments generally asks for a conference, and the Speaker of the House and the Presiding Officer of the Senate appoint the “managers,” as the conferees are called. Generally, they are selected from the committee or committees having charge of the bill. United States Congressional Serial Set – the U.S. Congressional Serial Set, commonly referred to as the Serial Set, contains the House and Senate Documents and the House and Senate Reports bound by session of Congress. It began publication with the 15th Congress, 1st Session (1817). Documents before 1817 may be found in the American State Papers. In general, it includes: committee reports related to bills and other matters, presidential communications to Congress, treaty materials, certain executive department publications, and certain non-governmental publications. Using the Serial Set – 85th Congress to 112th Congress available online through GPO, https://www.gpo.gov/help/u.s._congressional_serial_set.htm; ISL has the Serial Set from the 89th Congress to the 112th Congress in the basement. The call number (SUDOC) of the Serial Set changed over time. All titles before 1965 are located in the 3rd floor PD Vault. Serial Sets from the 89th Congress to 95th Congress (1965-1978) are classed as Y4 in the basement. Serial Sets from the 96th Congress to 112th Congress (1981-2011) are classed as Y1.1/2 in the basement. The Serial Set is NOT arranged chronologically. The serial number is a unique number applied to each book in the series of congressional publications running consecutively from the 15th Congress. The serial number may be useful for locating items, but not for citation. 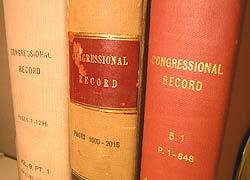 The documents and reports series have three numbers: an individual report or document-publication number, a volume number of each series for each session of Congress, and the serial number. Documents and reports can be located using the volume or serial number but should be cited using the publication number and Congress and session number. Question: Patron interested in viewing title Medals in commemoration of the XIII Olympic Winter Games: report to accompany H.R. 13174. They have a citation H. Rept. 95-1602 along with the title. How do you retrieve it? Answer: First step, check to see if it’s digitized online. You can using Google or go directly to GovInfo.gov. As of January 11, 2018, the House Report is not digitized. Since the report is not digitized, we look at the citation of the report (H. Rept. 95-1602). The report is from the 95th Congress and is House Report number 1602. A House Report that old means that it will be found with the U.S. Congressional Serial Set. Use this link, https://www.gpo.gov/help/u.s._congressional_serial_set.htm, and scroll the Numerical Lists of Documents and Reports. The Numerical List will allow you to find the Serial Set number of the House Report. House Report 1602 is located in Serial Set 13201-13. Now we know the volume that has the report. It is located in the basement. As stated above, the 95th Session is classed as Y4, so we go to that range and look for the volume 13201-13. Open the book and check the table of contents to ensure House Report 1602 Medals in commemoration… is there and hand the book to the patron. For example: House Document titled REPORTS TO BE MADE TO CONGRESS has the SuDoc Class Number Y 1.1/7:115-4. The date of the document is January 3, 2017. 2017 is part of the 115th Congressional Session, and the document is the 4th document published in the session. For example: Senate Document titled AUTHORITY AND RULES OF SENATE COMMITTEES, 2017-2018 has the SuDoc Class Number Y 1.1/3:115-4. The date of the document is September 14, 2017. 2017 is part of the 115th Congressional Session, and the document is the 4th document published in the session. For example: House Report titled OIRA INSIGHT, REFORM, AND ACCOUNTABILITY ACT has the SuDoc Class Number Y 1.1/8:115-19. The date of the report is February 27, 2017. 2017 is part of the 115th Congressional Session, and the report is the 19th report published in the session. For example: Senate Report titled INTELLIGENCE AUTHORIZATION ACT FOR FISCAL YEAR 2017 has the SuDoc Class Number Y 1.1/5:115-2. The date of the report is January 20, 2017. 2017 is part of the 115th Congressional Session, and the report is the 2nd report published in the session. GPO and Federal Depositories are actively digitizing federal documents, so while the report is not online currently, it likely will be in the future.